Do you struggle with catching too many colds or flus? Or do you have a friend or family member who’s wondering how to treat the flu? Maybe you’re ill right now and need some common cold or flu remedies, or maybe you want to be prepared for the next time you start getting sick. No matter your current situation, I’d love to share some of my top tips for how to prevent getting a cold or flu, or lighten your case if you do happen to catch something. I'll mention my favorite foods, essential oils, supplements, and lifestyle techniques. Additionally, while we’re on the topic of dealing with viruses like a cold or flu, I’ll share some of the tried-and-true techniques I use to keep my EBV (Epstein Bar Virus) at bay through the winter. Avoid sugar and alcohol. Though it can taste great, sugar depresses your immune system, leaving you more vulnerable to viruses and other pathogens (1). Additionally, alcohol is thought to be toxic for certain cells in your immune system, thus making excess alcohol a poor choice when you’re trying to enhance your immune function (2). Avoid dairy and gluten. Both of these foods are often inflammatory and immunosuppressive, unfortunately. If you are allergic or sensitive to either of these foods, this only makes the immune-suppressing qualities worse. Avoid any other food sensitivities. This might be obvious, but it’s important to avoid any foods you are personally sensitive to, as eating these foods creates inflammation and distracts the immune system from guarding against viruses. Eat 5+ servings of veggies a day. This helps keep your immune system strong. There are many ways to get your servings of vegetables in your meals. You can try salads, smoothies, soups, and other cooked/roasted vegetables. You can also incorporate fermented foods into your diet, as these will add an extra dose of gut-healthy probiotics. Eat extra foods with vitamin C. As you likely know, vitamin C is a powerful antioxidant, clearing out harmful, immunosuppressant free radicals. Foods that are rich in vitamin C include peppers, citrus fruits, broccoli, kale, cauliflower, strawberries, among many others (3). Eat enough high-quality protein. Good proteins help build antibodies to fight off infections, so it’s important to eat enough and get protein with every meal. Get your protein from clean meat and fish, beans, and nuts. Eat enough good quality fats. These help you absorb your fat-soluble nutrients like vitamins E, A, and D. Additionally, these fats will help you stay full so you’re not tempted to snack obsessively on sugary treats! Get your fats from high-quality salmon, raw nuts, hemp oil, avocado, and grass-fed butter. Turn off your WIFI at night (you can even put it on a timer). Try using Serenity oil before bed to help you relax and sleep better. Try time-restricted eating. Since different organ systems are fired up and functioning at different times of the day, it’s important to eat at the times when your body is prioritizing the digestive system. One tip is to eat within a 12-hour window or less, so your digestive system gets a break overnight. Have you ever heard of Thieves Oil? As history tells it, this is the oil that bandits used during the plague to avoid getting sick, and OnGuard oil is a version of that same blend! This potent oil contains orange, cinnamon, rosemary, and eucalyptus. This bottle has about 250 drops, so it lasts a while! You can use OnGuard in a cold air diffuser to help clean the air. You can also kill germs in your mouth by putting a few drops under your tongue or on your toothbrush. Additionally, you can dilute it in a carrier oil and rub it on your stomach, or put it on your feet before you go to bed as a natural flu remedy. 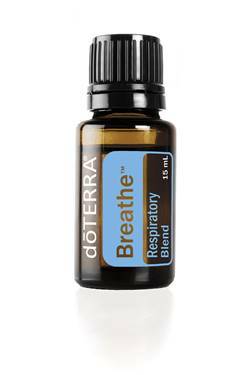 This is doTERRA’s respiratory blend, and it contains eucalyptus, peppermint, melaleuca, lemon, cardamon, raventhara, and laurel leaf. Like most essential oils, these oils do have antifungal and antibacterial properties; however, the magic of this oil is that it helps open up your airways. Breathe can be used in a cold air diffuser, or can also be rubbed on your chest to help with breathing, as an easy home remedy for coughs and colds. This blend is a fantastic support for the digestive system. As you likely know, the digestive system is the home of most immune activity, so this is a crucial area to support. This blend includes the essential oils of anise seed, peppermint, ginger root, caraway seed, coriander seed, tarragon plant, and fennel seed. The DigestZen roller bottle blend is a great choice to rub on your stomach to help with digestive woes. This is an enzyme and essential oil supplement to help support digestion. I’ve tried a lot of digestive enzymes, and Terrazyme is my very favorite. You can purchase it here, but the cheapest way to buy is when you add it on to the LifeLong Vitality Pack. While there is some disagreement as to how silver spray works (read my blog about silver spray facts and myths here), I have found it to be very effective in treating viruses and bacteria, and it is one of my favorite home remedies for colds. I use this supplement daily in the winter to prevent colds and flus and to keep my Epstein Barr virus in check. This easy-to-take spray formula can also be used for children. This brand is my favorite, the highest-quality silver spray I can find. This vitamin is crucial for immune function, as it helps to launch the immune response. Unfortunately, most of us are deficient in this vitamin (5), making it all the more important to make sure your vitamin D levels remain healthy. Here is my favorite high-quality vitamin D supplement, which supplies 5,000 IU, a great maintenance dose. If you don’t know your current level of vitamin D or have questions about your levels, click here to read my blog on vitamin D and learn about my recommendations for handling this. This is an antiviral, antibacterial, and antioxidant supplement that is less well-known. I was introduced to this when I was learning how to manage my EBV and have found olive leaf extract to be a very well-tolerated and effective antiviral in the winter. It works for me as either a prophylactic (preventative) support or as a triage support if I've become sick. As I mentioned, healthy digestion is crucial for good immune function, and most of the immune system resides in the gut. To support your gut health, I recommend using a high-quality spore-based probiotic like MegaSporeBiotic. This is hands down my favorite probiotic. Did you know fish oil can actually make your cells stronger and more resistant to viruses? When I feel like I’m coming down with something, I take a spoon full of liquid fish oil to slow down the viruses. Make sure your body is properly fueled with the vitamins and minerals you need to stay healthy. You can check out my favorite multivitamin pack here. Keep the lymph moving. I highly recommend getting a dry brush and using it each morning to keep the lymph flowing. I also like to use Citrus Bliss on my throat and neck to help with lymph flow. Use antioxidant-filled/thyroid-supporting oils. I like to use melissa, rosemary, lemongrass, and myrrh for my EBV, as they are high in antioxidants and are supportive of the thyroid. Since my EBV seems to live in my throat, I apply it topically to my neck area as a preventative. I’ve been studying and collecting high-quality supplements for years now, and my shop is the compilation of my personal favorites, including the supplements I told you about above. New to shopping with us? Use the code ‘NEW15’ at our shop to receive 15% off your first order. Returning customer? We offer free shipping on all orders over $150. Interested in essential oils? Check out my favorite quality oils here. You can find some great deals, and if you purchase a wholesale membership, you’ll get 25% off each order for a year, as well as qualify for monthly rewards. Now I’d love to hear from you. What do you do to keep sickness and viruses at bay? Do you have any tricks that I didn’t mention here? Newer PostHow Toxic Is Your Bed? Older PostYour Post-Holiday Detox Plan!